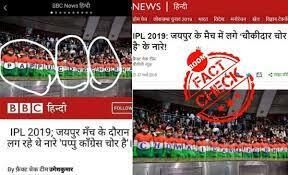 A photo purporting to show a news article by BBC Hindi that includes a picture of spectators sporting the words ‘Pappu Cong chor hai’ (Pappu Congress is a thief) painted on their bodies, is photoshopped. 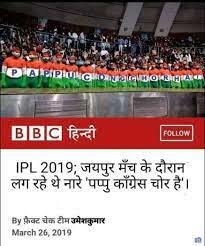 The fake image claims spectators taking a dig at Congress President Rahul Gandhi chanted ‘Pappu Congress chor hai’ during the Rajasthan Royals and Kings XI Punjab match held on March 25, 2019. The Facebook post with the fake image can be viewed here and its archived version can be accessed here. 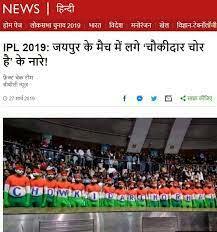 When BOOM checked for BBC’s fact check on the incident, we came across the original article where the headline states, “IPL 2019: Chowkidar Chor Hai Slogans Raised At Jaipur Match.” BBC’s story can be accessed here. 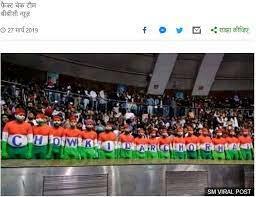 The same image has been photoshopped and the word ‘chowkidar’ has been replaced with ‘Pappu Cong’ in the viral post. We ran a reverse image search on the photoshopped picture and then used to time filter to check if the image was online before the IPL started i.e. March 23, 2019. We found that the image was posted on Instagram handles of Congress workers in January. We then further looked for the image and found out a video from January 30, 2019 which had the same group of men with the ‘Chowkidar Chor Hai’ slogan painted over their bodies. The video is from Indian National Congress’ Yuva Kranti yatra held at Tal Katora stadium in Delhi on January 30 this year. The event was addressed by Rahul Gandhi. 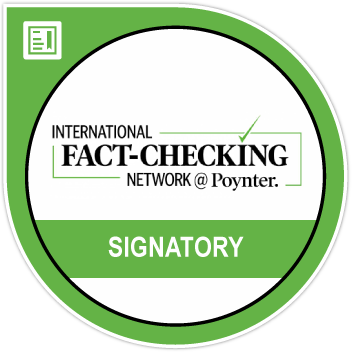 BOOM’s fact check on the ‘ chowkidar hi chor hai’ slogan raised at the Jaipur IPL match can be read below.